As I'm sure you've heard, unless you've been living under a rock or have stayed away from technology for some reason, it was reported that Justin Upton invoked his no-trade clause to block a trade to the Mariners. This news isn't entirely surprising, but it is disappointing for us Mariner fans. Some Mariner fans anyway. The prospect of receiving a hitter who could actually hit a baseball out of the infield was an intriguing one. Slight exaggeration there, but not by much. There are multiple posts and actual news articles out there that talk about it, such as this one by Scott Miller over at CBSSports. This post is mainly a fan's perspective and opinions that may or may not reflect what you think/feel/say and should be taken as such. There are a few aspects that could be taken into account and while I'm no expert, I'm going to try and pretend to know what I'm talking about anyway. The no-trade clause Justin Upton has in his contract is limited to four teams with the four for this season being the Red Sox, Cubs, Mariners and Blue Jays. Obviously, those teams aren't on that list because they're bad hitter's parks and the teams are perennial losers. Most limited no-trade clauses have the Yankees and Red Sox on the list because, if the player is going to be traded to one of those teams, they're going to get paid and the teams will pay. With the Mariners upcoming offseason, a lot of money was coming off the books and they'd have the money to chase free agents to improve their offense. Upton's agent saw the writing on the wall and placed the Mariners on that list. Because of this, Upton said no to the Mariners and now the Mariners are headed back to their side of the dance floor to consider their options. We'll get to those options in a minute, but first the package that was reportedly accepted by the Diamondbacks. In the CBSSports story by Miller, the prospects/players in the deal were Taijuan Walker, Stephen Pryor, Nick Franklin and Charlie Furbush. For me, the only real heart breaker would have to be Walker. He's one of the top pitching prospect not only in the Mariners system, but in all of baseball. I talked about him in the previous post and how a deal would probably not happen without him. I mentioned some apprehension at giving up such a prospect, but you have to give to get. Other than Walker, none of the other guys would really hurt my feelings if they ended up on another team. Pryor and Furbush are relievers long-term and good relievers aren't terribly hard to come by. Not only that, they're also volatile and prone to under- and over-valuing of their skills based on small sample sizes. Not only that, with most relievers it's not a foregone conclusion they'll be amazing or abysmal in any given season. For an example, look no further than Fernando Rodney's 2012 season with the Rays. Franklin would be a little hard to stomach with as close as he is to the big leagues, but he's not a future shortstop and the infield is pretty well set with Triunfel being the probably replacement for Brendan Ryan. First base is up for debate, but there are other players already on the roster that could fill that hole if need be. Franklin is still young and could potentially be a 20/20 guy in the future, but he's no Justin Upton. Still, a 20/20 middle infielder under team control for the next 6 years isn't anything to sneeze at either. So what does this mean? It means that Jack Z, whether rightly or wrongly, was pushing pretty hard to land Upton and he was willing to pay to get him. Whether you think its a fair deal or an overpay is irrelevant. We wouldn't have known until at least 3-5 years down the line when we see how the prospects and younger guys pan out, so arguing over that would be fruitless. What we do know is that the Diamondbacks front office found the Mariners' front office's offer to be sufficient to acquire the services of Justin Upton. Upton himself, obviously, did not. Or rather, he really didn't care what the Mariners were offering, he just didn't want to go. Well wait a minute, what's the "Possible Phoenix" in the title? Well, out of the ashes the Phoenix may rise again. Don't go holding your breath and hoping it does, but the possibility exists so it shall be discussed. Just because Upton turned down the deal and gave Seattle the big ol' middle finger doesn't mean a deal won't get done. We don't really know why he turned it down and as of right now, it's entirely possible he'd do it for a restructured contract or an extension for more money. That doesn't mean that's all it is, but again, nobody really knows yet. Putting the Mariners on his no-trade list could be because he really doesn't want to play for the Mariners or he did it as a financial thing. As we all know, things are very important because things are things. 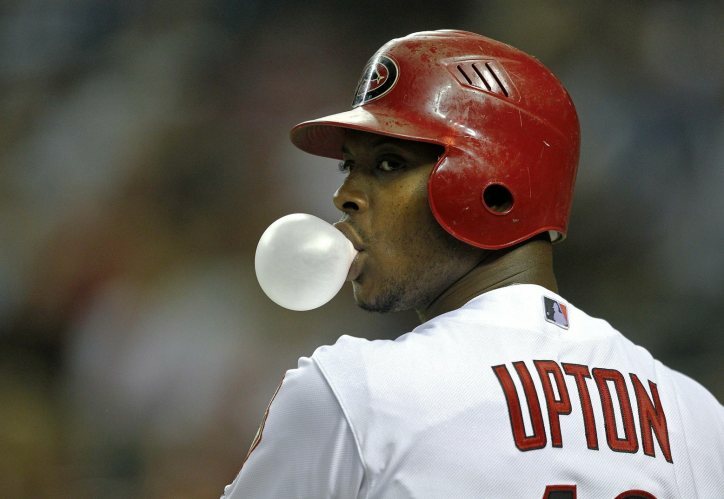 By all accounts, the trade was agreed to and THEN the Diamondbacks took it to Upton for a yay or nay. He was not privy to what was going on and had no recourse except to say no. Granted, he could have just said yes, but then why put the Mariners on the list in the first place? A deal could still get done if the Mariners are allowed to talk to Upton about his contract and the money, but that's just speculation at this point. Right now, all we know for sure is that Upton said no. As stated in an earlier post about the Mariners pursuit of free agents, it's not always the team's fault. The player has say in his destination and that was the case yet again this offseason. The lack of major moves hasn't been from a lack of trying, but by a lack of reciprocity on the part of the player. It's still possible something could get done before the start of spring training, but its looking less and less likely. There's still the possibility of Mike Morse for the Mariners or Upton if there's something behind the scenes going on we don't know about, but as of right now, the 2013 season may be a long one and this time, you can't put the blame on the front office.